In the second week of the insurance debacle with BoatUS, I was left waiting. I had an estimate from the yard for boat repairs, and was in a state of limbo, wondering what would happen to my home. The next step in the process was the surveyor submitting his report on my boat to the insurance company, and I wasn’t sure what the report would say or recommend. BoatUS had the power to determine the future of my little boat, and I was at their mercy. What I did in the interim, in the phone and email silence, was write, wonder, and seethe. What happened to my boat was a great injustice to me, and I felt every bit as angry as any of you would had someone driven their car into your bedroom. My home had been violated. Since I was anchored out past all port and city lines, far from marina traffic, and ashore at the time of the ramming, it was clear that I had done nothing wrong. And yet, there I was, in the middle of the perfect sailing season, which only lasts but a few months in the Pacific Northwest, spending countless hours writhing over what had happened through no fault of my own. The rammer, the person responsible for what happened to my boat and home, he didn’t have a hole in his house. He didn’t lose his summer. He didn’t have to deal with an insurance company to have his home repaired. He didn’t have his life, work, and summer disrupted and ruined. But he was the one at fault. If you’re reading this and feel the urge to tell me that “Life’s not fair,” allow me to spare your fingers the need to type it. I’m well-versed in life’s lessons of unfairness. I’m also aware that “it could’ve been worse,” so there’s no need to point out that axiom either. I have also kept this ordeal in perspective, and wrote a post to stave off comments on the obvious. 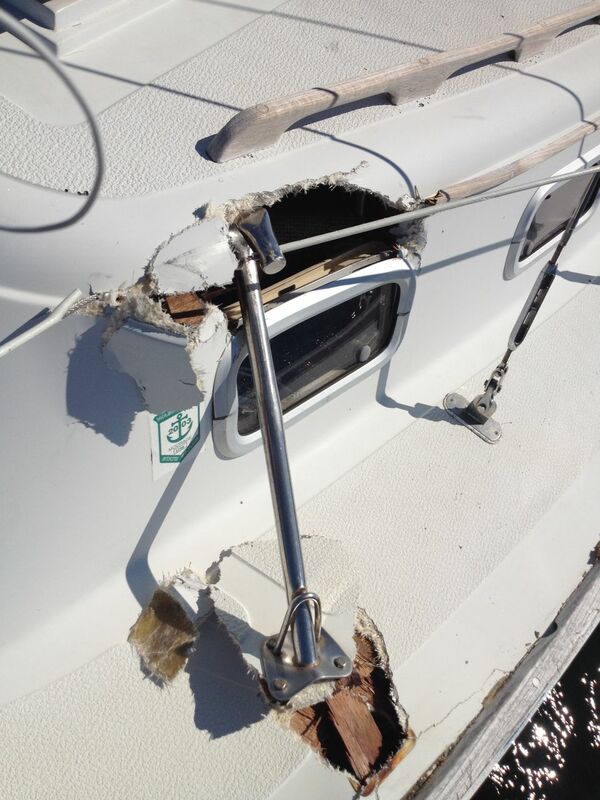 Though my boat being hit isn’t as bad a problem as losing a limb, it’s still a problem in need of addressing. Even though it’s not been long enough to look backwards, I’ve grasped at what, if anything, was to come out of this incident. Small events set bigger ones in motion, even something small and innocuous can alter our futures and lead us someplace we’re supposed to be. But. While living in a hole, in the midst of summer, and not hearing from the all mighty insurance company, I was mostly incensed. I’d like to say I was entirely calm and taking it in stride, being philosophical and searching for the silver lining (that part comes later) but I wasn’t. Enter Mr. Isaac Anderson, attorney at law. I’ve known Isaac since moving to Washington, and to say he’s incredible is an understatement. Even Isaac himself is a bit understated, but beneath his quiet demeanor there’s a go-get ‘em attorney with a quick wit. Isaac is one of my first web design clients, and we get along well. He read my post about the boat being hit. He asked to have a coffee meeting to discuss it. At the meeting, he asked how I was dealing with it, what was going on, and then insisted he step in. Isaac took over completely, and asked that I send him all of my records for the incident (Oh yeah, I’d been keeping a daily journal of what happened, what was said when, and with who, down to the hour and the day). I sent him emails from the insurance company (before they’d abruptly stopped). Isaac told me not to worry, he’d handle them from here on out. And so he did. He first started with a letter to my adjuster, who as we know never initiated contact with me. In the letter, Isaac pointed out the facts, outlined what the insurance company was responsible for, and gave them a wee warning, a shot across the bow if you will, for what we would do next if it came to that. He then gave them three business days to respond to the letter. Three days meant more waiting, but I felt much better having an attorney on my side. It seemed only polite to blog about my boat being hit, because I love you guys, and needed to update you on what was happening to my boat. I had wanted to wait a while to see how the insurance process was going to play out, how quickly it would move, but found myself impatient. Just two days after the incident, I updated my blog. From there, things got…interesting. With the posting about my situation, many of you all chimed in with a common question, sometimes asked bluntly, sometimes it was implied in the tone of the message or comment: How can we help? I see my internal numbers. I know how many of you are here, where you come from, and how active you are, both on this blog and when speaking of it elsewhere. This blog is not the most popular sailing blog out there, but it certainly isn’t unpopular either. The story of my boat being hit didn’t go viral, but it got out there, and it got out there fast. Three Sheets Northwest posted it as their lead story on Monday morning, starting off week two of my insurance nightmare with a powerful foghorn blast. Other fellow sailors picked up the post and used the topic as a springboard for their own posts: what if this had happened to me, or to you, they’d ask. How many people did the story reach? I can’t say exactly, but I can tell you that since the posting, both me and the boat have been recognized by people I’ve never met. “Oh,” people have said, seeing the boat (if I’m docked to refill water or charge up the batteries), “are you Courtney?” There aren’t too many Islander 30s out there with two hefty bags taped to the port side cabin with a destroyed stanchion. Even a broker I’d emailed about a boat, called me back and said, “I actually know about you, I read it through Three Sheets!” I guess that’s why they call it infamy. Both my attorney, and most definitely you, the readers of my blog, got the attention of BoatUS. What makes a good liveaboard boat?